By the eleventh week of the inaugural United States Football League season, the Philadelphia Stars had put together a league-best 9-1 record. However, the Chicago Blitz, a team stocked with ex-NFL veterans and coached by George Allen, was 7-3 and, in the minds of many sportswriters, still the team to beat in the USFL. On May 15, 1983 the Stars hosted the Blitz before 20,931 fans at Veterans Stadium, and for three quarters Chicago held the upper hand. 15-year veteran QB Greg Landry passed to WR Lenny Willis for a 24-yard first quarter touchdown. While the Stars got on the board with a 46-yard David Trout field goal and took the lead in the second quarter thanks to a 12-yard TD pass from QB Chuck Fusina to WR Tom Donovan, the Blitz went up 14-10 before halftime with a seven-yard touchdown run by RB Kevin Long. Chicago was ahead 24-10 at the end of the third quarter, and appeared to have the game under control, after a nine-yard TD throw from Landry to WR Trumaine Johnson and a 37-yard field goal by Frank Corral. But Philadelphia came back in the fourth quarter. First, the Stars engineered a 57-yard drive that culminated in a three-yard scoring run by star rookie RB Kelvin Bryant. LB Jon Brooks recovered a fumble on the Chicago 16 yard line that led to another touchdown run by Bryant, this from five yards out, that tied the score. The defense made another big play on Chicago’s next possession, with LB Sam Mills (pictured above) recovering a fumble on the Blitz 19. Shortly thereafter, Fusina rolled out to his right and scrambled 17 yards for the winning touchdown. The Blitz could not come back – the final score was 31-24. While the passing yardage was virtually identical (156 to 155 in favor of Philadelphia), the Stars outrushed the Blitz, 204 yards to 141. Kelvin Bryant had a typically strong performance, rushing for 98 yards and the two touchdowns on 23 carries. Chuck Fusina (pictured at left) completed 16 of 28 passes for 187 yards with a TD and one intercepted; crucially, he also ran for 87 yards on 12 attempts, including the winning score. WR Willie Collier was the team’s top receiver with 5 catches for 79 yards. Chicago’s solid running game, as usual, featured Kevin Long (76 yards on 16 carries), formerly of the New York Jets, and standout rookie RB Tim Spencer (65 yards on 15 rushes). Greg Landry completed 13 of his 24 passes for 156 yards with both a TD and an interception. The other star rookie on offense, Trumaine Johnson, led the receivers with 6 catches for 82 yards and the TD. The result was in keeping with the season’s outcome for each team. Philadelphia ended up on top of the Atlantic Division with a 15-3 record and lost the league title game to the Michigan Panthers in a close-fought 24-22 contest. Chicago wound up at 12-6, second in the Central Division to the Panthers as a result of tiebreakers. They lost to the Stars in the Semifinal round, once again due to a late comeback. The veteran team that had entered the season with such high expectations exhibited a tendency to lose leads late in the going. 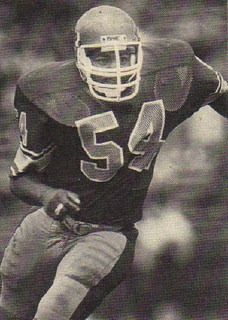 Kelvin Bryant ended up second in the USFL in rushing with 1442 yards. Greg Landry ranked third in passing in the league, two ahead of Fusina, although Fusina’s 2.4 interception percentage was the lowest among qualifiers. Trumaine Johnson had the most pass receptions and yards receiving in the USFL’s first season, with 81 for 1322 yards and 10 TDs. Significantly for the Stars, as was demonstrated by the two timely fumble recoveries in the fourth quarter, the defense had the best turnover ratio in the USFL (+35) and recovered the most fumbles (28). Fourth in total defense, they averaged the fewest points yielded (11.3 per game) of any unit in the league. Sam Mills and safety Scott Woerner were both All-League selections.